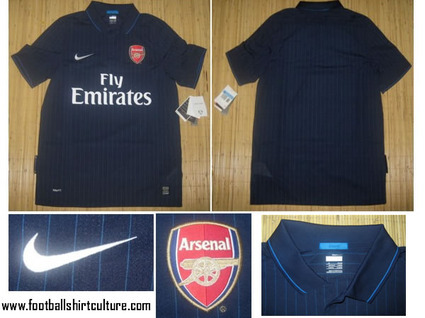 This is a leaked photo (montage) of Arsenal’s away kit for the 2009/10 season. First thing you notice…Â it’s blue, like the sort of blue worn by bitter rivals Spurs. Second thing you notice, it looks cheap and nasty. That’s what I think, anyway. Some of you might dig the colour and subtle pinstripes. Not me -Â I hope it’s a fake. Arsenal’s current yellow-and-blue away kit is much, much better. Still, it’s pretty bland compared to the current one. ha, it looks like one of those cheap copies from thailand you can get on ebay for like $15 US…perfect…. I’m calling this a fake…the edges of both the Nike swoosh and the Emirates logo show pixelation and obvious blurring when enlarged. i dont mind this kit to be honest. I prefer the white one though. Ive seen better.